The scooter is not electrically-propelled. Styling of a premium stylish scooter. Gets single-sided front suspension like the Vespas. Just a couple of days back we reported that Bajaj is working on new intra-city mobility solutions under their brand new Urbanite sub-division. Now with these image leaks, we are sure that Bajaj is getting back to making scooters. We figured that it would be an e-scooter but it looks likely that the first few products will be powered by an internal combustion engine. The brand Urbanite is said to focus on future of urban mobility. Scooters are certainly one of the most preferred ways to commute within the city. Although e-scooters certainly seems to fit the future part of the bill, we figure that Bajaj is not starting off on an electric note as there just seems to be lack of a charging infrastructure in place. Hence, a normal fossil fuel-powered scooter seems the logical way to begin. 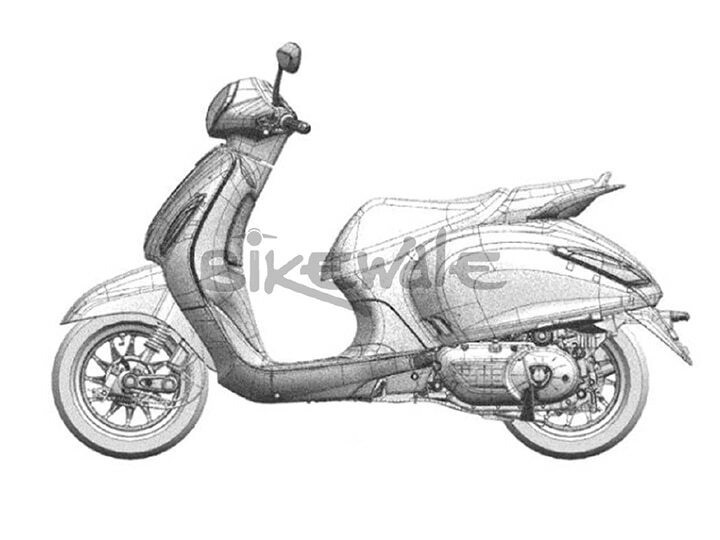 From the sketches, one can draw parallels to the Vespa range of scooters as well as the Peugeot Django. The body panels are quite similar to the Django with the classical wide body stance. The front suspension seems to be kind of like the Vespas with the single-sided front suspension with anti-dive function. There is a large round panel where the instrument console should be and we guess it will be as funky as they come.